Meranda Writes » Blog Archive » What’s in my reporting arsenal? The purpose of life is to matter — to count, to stand for something, to have it make some difference that we lived at all. This entry was posted on Monday, September 8th, 2008 at 10:52 pm	and is filed under Commentary, Ideas, Journalism, Offline, Technology. You can follow any responses to this entry through the RSS 2.0 feed. Responses are currently closed, but you can trackback from your own site. There’s other stuff I carry with me sometimes but these are the absolute basics. Like you, I only take the laptop with me when I know I’m going to need it (e.g. conferences where I’ll have time to write stories, etc). 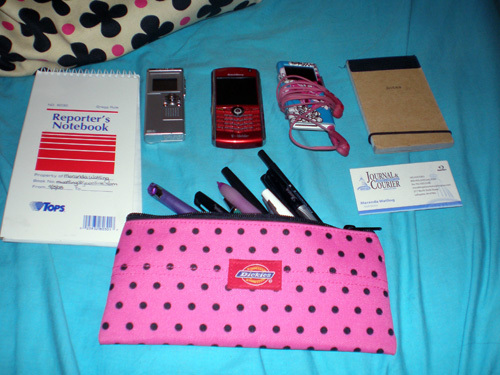 A lot of what you mentioned carrying is what I carried around in my tote bag as well when I did reporting. Especially the hand sanitizer! Although, I opt for the Tide-to-Go pen rather than Shout Wipes. + USB cable. You never know when you need one. I found this works w/ a lot of digital cameras, recorders, portable harddrives and my BlackBerry (bonus for being able to use the BB as a tethered modem for the laptop w/ it). + Flash Drive. I find use for it from time to time, although you won’t need this if you have other USB storage devices. + Audio cable. This was useful for plugging into audio boxes at press conferences and feeding the audio directly into my recorder. + Spare batteries. This has saved me and a few friend reporters from on several occassions. + Spare change. Because there’s always a meter to feed. A spare set of shoes for traversing those rural fields in western Pennsylvania. @Vera: Interesting our bags are so similar. :) Though, I don’t actually keep a diary or journal and if I’m lightening my load, my book is usually the first to go since I tend to read hard cover. @Kiyoshi: I have a Tide pen in my desk at work, where I also have two other types of hand sanitizer. ;) You’re also more thoughtful about cords, batteries and change. (We don’t have more than a handful of parking meters here, we just have a lot of one-hour parking.) I should keep batteries around, and I actually do keep my camera cable around. @Cory: I keep a hair tie on both wrists every day, so that’s a given. My hair is halfway down my back long, and you’re right in rain storms or windy days as are common here, sometimes it needs to be pulled back. Re: Umbrella, I feel silly in rain jackets, and have gotten pretty good at holding the umbrella and the notebook in one hand. That said, a huge downpour this may not be so practical. Extra shoes is a good idea, too. My “backpack” size changes on what I think I’ll need for the day. There’s also a tripod in the car. And by reading this I realize I’m almost out of hair ties. A fold-out Bluetooth keyboard for my T-Mobile Dash, used for Twittering life events and filing stories. A Canon HV20 high-definition video camera with extra batteries. A video camera bracket (I bought from a big box electronics store for $12) that connects to the tripod mount and can be used add the shotgun mic (which sticks out over the lense if you mount it on top of the camera) or a wireless kit. Sometimes, there’s a wireless lavalier mic kit. A homemade adapter I can use to connect the miniplug from the AV input on the HV 20 into professional XLR and BNC connector for professional TV cameras, so I can plug into the court pool video. An adapter to go from an XLR on the shotgun microphone to the miniplug on the Canon and/or the Edirol. Extra batteries in the front pockets, business cards, and a cheat sheet on the specs for compressing video for our web site. Firewire cable for downloading video. Ponytail holders (not for me, but they’re great to keep cords from tangling). (I also keep a tripod in the car, but I’m trying to figure out a way to carry that with me; photogs tell me to just get a suitcase strap and sling it over the other shoulder). @Mark: Good point about the knife! I carry a Victorinox “SwissCard” with me all the time. It’s like a Swiss Army knife, but the size of a credit card with scissors, pen knife, toothpick, tweezers & a combo nailfile/flathead screwdriver. Important to note though: Remember to never bring any knife into a courthouse, no matter how innocently small it seems. Nikon P5000 10 mega pixel digital camera – why this one? : good grip, full manual control, shoots quite good video and with a 4 Gb SD card, you can record 10-16 hours of voice if required (or 2 hours of video, cards are cheap as well). Bag large enough to pick up reports that are available at the meetings I go to. This is half the stuff I was carrying even a year ago. I would have never of thought of using the digital camera for news if it wasn’t for a visit to CERN and the Large hadron collider last year. Shot some video as an experiment and the quality was decent enough to post to the web site. Stool – you’ll be amazed how useful a portable stool can be sometimes.